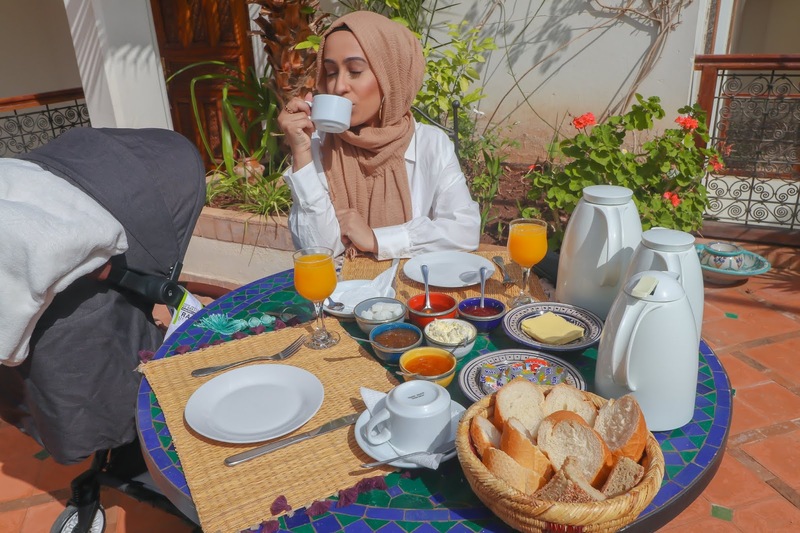 I know I promised you all I would put together a blog post on traveling with a baby, and it is coming, but first I wanted to put together a quick little guide to Marrakesh. Now, there is no way I can proclaim this is a Marrakesh travel guide, because it isn’t. Theres so much to see and do in this amazing city, and I feel like we only got a tiny insight so it would be wrong of me to mislead you into thinking this was a comprehensive guide. What I can do though, is talk you through our experience, what I would and wouldn’t recommend and what I enjoyed. So firstly, flights - for some reason every time Fizan and I go away we get a tonne of dms asking us how we booked our holiday. If its not a press trip, then most of the time I will use Skyscanner to find the cheapest flights and then go to the flight providers website and book direct. A lot of the time, once we’ve added luggage and seats and all the extras the flights end up being a lot more than they were initially so do bare that in mind when looking at skyscanner. The earlier you book, the cheaper it is and you can normally get very affordable flights from Gatwick or Stansted (prebook for better prices on the parking!). In terms of hotels, we split our time between a Riad and a Modern hotel. I loved staying at the Riad, it actually reminded me of Pakistan so much. The style of the buildings is just perfect to enjoy the beautiful Moroccon weather, but is also convenient for when it rains (which it did, non stop, the day we arrived). The Riad we stayed in was 3 storeys with a courtyard in the middle, the courtyard housed a large orange tree which branded all the way out to the second storey - it was the perfect place to enjoy a home made Moroccan breakfast everyday. The Riad also had a small pretty pool and was decorated throughout in traditional Moroccan design. Whilst i enjoyed the Riad, I would only recommend a night or 2 if you are staying with children. The building it self didn't have a lift which meant we have to leave the stroller downstairs, and the cobbled steps probably wouldn’t be ideal for young children. 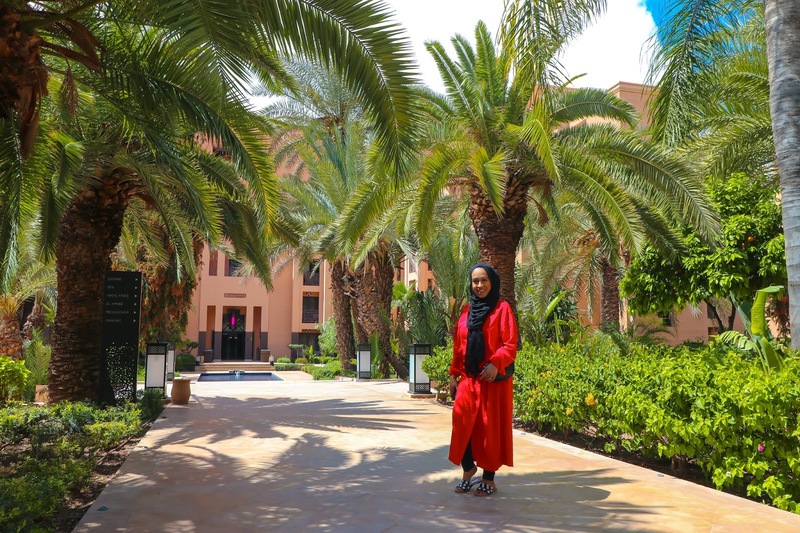 It was an amazing way to experience the real Marrakesh and have some home cooked food, but if you have young children I would opt for something a bit more modern which has all the amenities you need. The second hotel we stayed in was Movenpick Marrakesh. 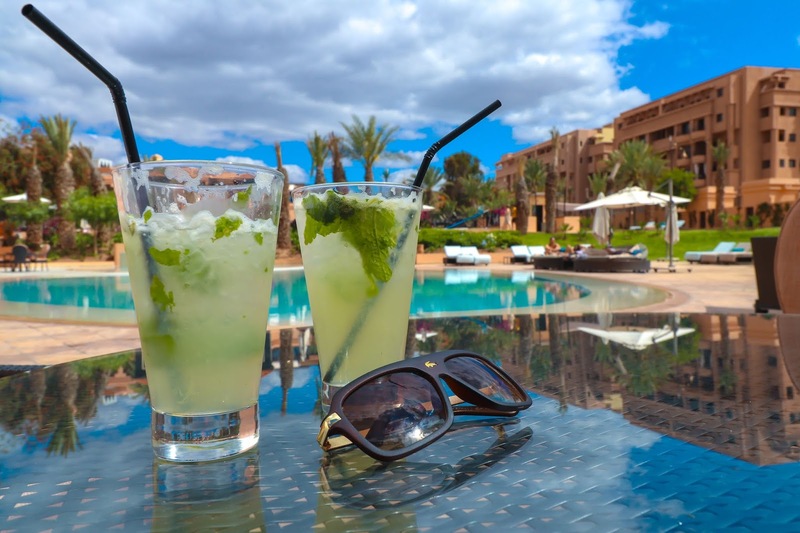 Now I have stayed in a lot of hotels, I’m lucky enough to go on a lot of press trips where we get to stay at 5* places and receive quality customer services - but none of the hotels i have stayed in beats Movenpick Marrakesh! 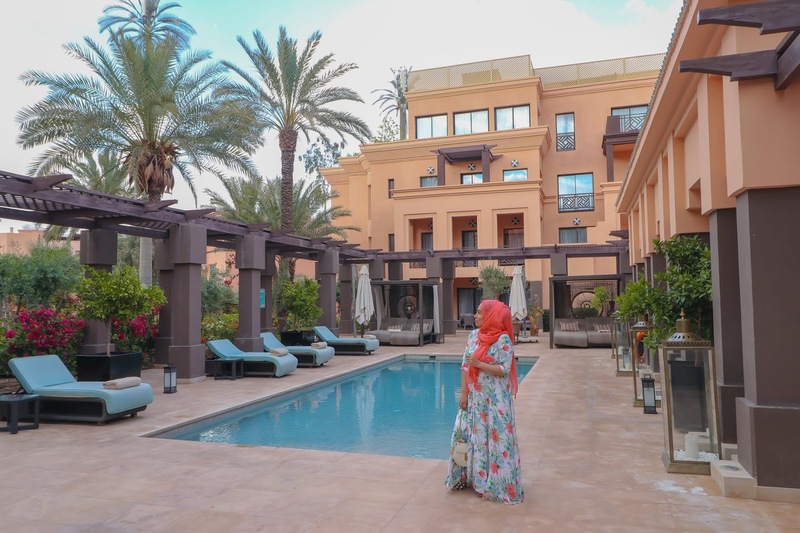 The place is just so beautiful - it has 3 pools, rows upon rows of palm trees and is decorated internally with modern Moroccan decor and fresh flowers. 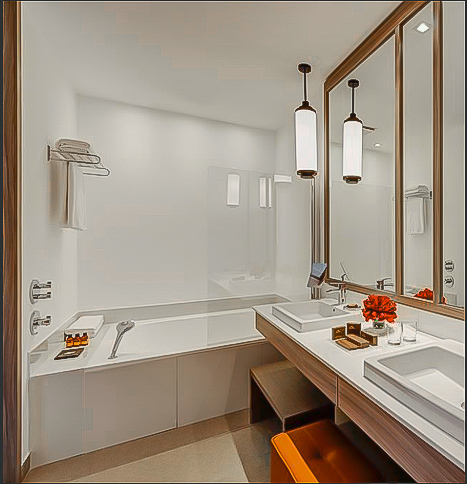 Water features play a large part in the design and I believe it has been renovated recently because it just feels so new and fresh. Our room was quite far from the reception, but i honestly didn’t mind because it meant we got to walk through beautiful gardens filled with white and red roses - (I may have picked a couple of these for my evening bath in the huge bath tub in our room). Our room had a Queen size bed which I so badly wanted to bring home with me! Noah co-sleeps with us when we’re travelling as he’s only 4 months and I don’t normally like using travel cots. After the 3 of us squeezing on the normal sized bed in the Riad, the Queen Size bed at the Movenpick was so warmly welcomed! 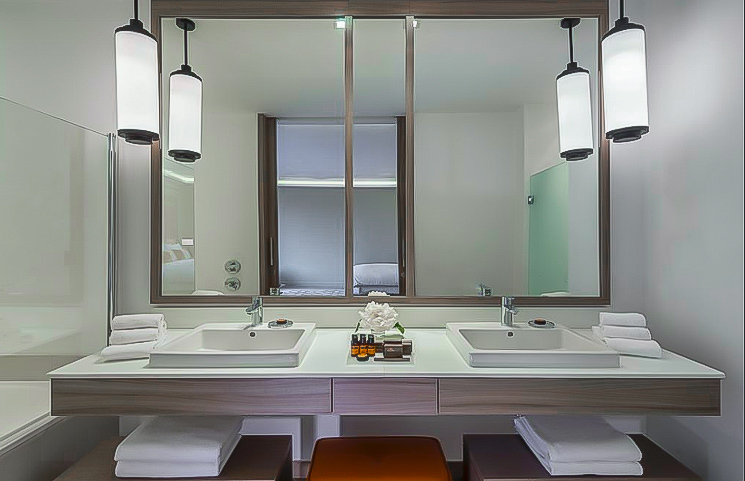 The bathroom was absolute goals, with 2 sinks so me and Fizan had our own little station to get ready - and of course the huge bath tub that I have already mentioned. I treated myself to a soak with bubbles and flowers the first night we got there! The hotel serves a huge buffet breakfast, they have a kids club, and the most amazing burgers that you can eat by the pool. They even have a couple of restaurants on site, so Fizan and I actually got to enjoy a really romantic date at the Brazilian joint with some delicious virgin mojitos and steak! I absolutely loved the Monvepick, but it is very easy to spend all your time there and not experience the real Marrakesh, so do make sure you go out and do some sight seeing. In terms of sight seeing, I had a whole itinerary planned of everything I wanted to do, but unfortunately firstly I didn't anticipate that the weather could turn bad (we had rain 2/6 days we were there) and secondly I didn't realise how much harder it would be to do things with a baby! That being said, we did get out and about and I fee like we explored the real Marrakesh. My favourite place by far has to be the main town square, Jemaa El-Fnaa. It was a short walk from our Riad and every time we ventured out it felt like we had been transported to another realm. There was so much to see, and hear, and smell and taste! Whilst I was too worried about trying the street food - the last thing I wanted was to get sick whilst travelling with a baby - I did have a number of fresh juices! The main square is lined with row upon row of food vendors and fresh juice vendors and there is so much to try - every single juice stand I tried was equally as refreshing and tasty so I recommend them all. Behind the main square you’ll find all the stores - I’m not sure what to call them, the souk? The bazaar? Anyway, its row upon row of stores - stores selling, spices and Argan oil, morocco lamps, beautiful designed moroccan plates and tangines, little animal figurines crafted out of wood, leather satchels and leather shoes.. and so much more. You could easily spend all day there, and we did - on more than one occasion! I normally hate trying to barter - but the shop keeps will quote you prices that are around 300% more than what they want so bartering is all part of the fun! I read lots online about Marrakesh not being safe, and I never felt like that throughout our trip - but the shop keepers can be a bit forceful and there are lots of beggars that will harass you around the markets so thats all stuff you need to be prepared for when you go. We didn’t do any other touristy stuff whilst visit although YSL gardens had been on our list, I read online that the queues are always crazy and to go early to avoid them - but we never woke up before 9 am so we gave the gardens a miss. 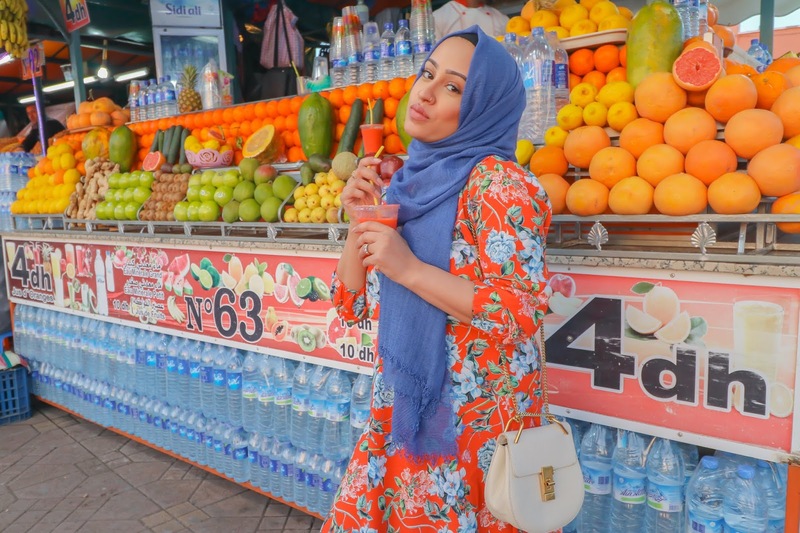 We spent our time in Marrakesh watching daily life and enjoying local food and I feel like that was so much more valuable than doing the touristy things. 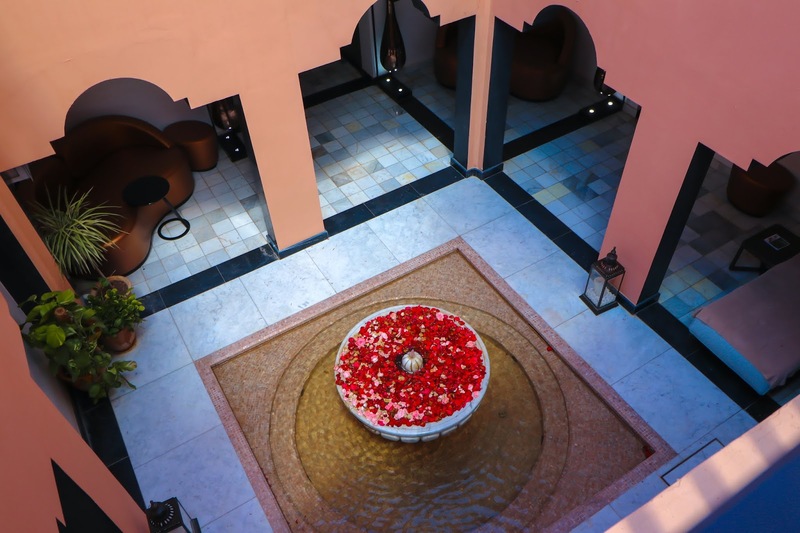 We went for a Moroccan hammam at La Sultana Hotels - which is a beautiful luxury Riad situated near the main square. The hammam was pure bliss, and whilst I felt awkward and embarrassed to be washed by someone else, at the end of my massage and wash I wanted to do it all again because it felt so amazing!